Posted on August 11, 2018 Posted in Ice-cream & Sorbet	. I’ve dabbled with using frozen fruits, yoghurts and varying cheeses as base alternatives to the usually high fat and sometimes not even dairy ice-cream in the past. So I decided to combine my favourite dessert, Tiramisu, with my 3 go to ice-cream alternative products. After a bit of trial and error I landed on banana for the fruit (unsurprisingly), natural yoghurt (not Greek, this won’t work with the flavour mix) and cottage cheese (Ricotta was a close second). 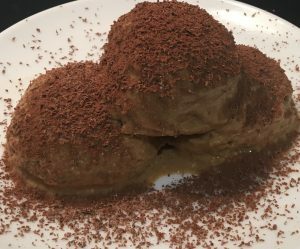 The outcome – this recipe is a must for all Tiramisu lovers that want to indulge but want low fat. In fact, apart from a little chocolate and sugar this recipe is natural, satisfying and super healthy. Place the bananas in the microwave until just slightly softened. 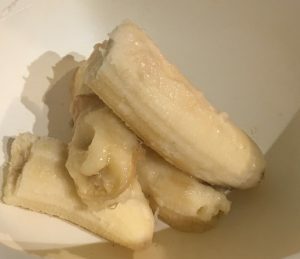 Peel the banana’s and place in a bowl. Boil the water and add the coffee granules, stir. Set aside to cool. Add the banana, coffee, cheese, yoghurt, Masala, sugar and salt into a food processor and blitz until combine. Melt the while chocolate in a small bowl in the microwave in 30 second bursts until just melted. 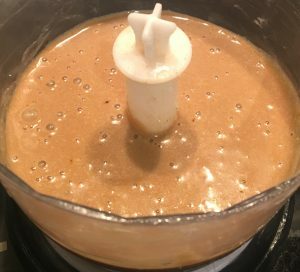 Pour the while chocolate into the mix and blitz again until well combine. Add the dark chocolate and stir until combine. 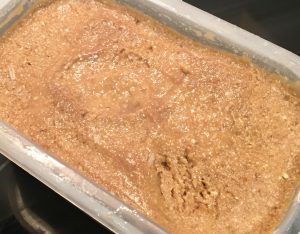 Pour the mix into a bowl and place in the freezer for 4 hours to set completely. When ready to serve take the ice-cream out of the freezer, scoop and enjoy. Tags: bananas, coffee, cottage cheese, masala, tiramisu, yoghurt	.